Pedestrians made their way across Main Street in downtown Worcester on Oct. 11, 2013. Cities struggle when they’re built like doughnuts, with plenty of residents and office workers clustered on the periphery, and hollow space filling the center. This is the problem that CitySquare, Worcester’s half-billion dollar downtown makeover, tries to correct. As it does, Worcester has been remaking its downtown in other, equally significant ways. CitySquare’s sheer size and ambition tend to overshadow everything else that happens in downtown Worcester. That project does deserve all the attention it gets. When CitySquare broke ground three years ago, it was the largest post-urban-renewal downtown revitalization project in the state’s history. CitySquare will replace a twice-failed mall from the 1970s with 20 acres of new offices, apartments, retail shops, streets, and sidewalks. The development site sits in the center of Worcester’s downtown, and the city’s broader downtown turnaround can’t succeed without new life emerging at the site of the old mall. A generation ago, construction crews plunked the original mall on top of several existing streets, turning the stretch between Worcester’s main drag and its commuter rail station into a network of sketchy urban cul-de-sacs. Contractors have already leveled the old mall and rebuilt streets lost to 1970s-style urban renewal. For all the importance of re-linking the city’s rail hub and its urban core, Worcester’s downtown turnaround isn’t just about remaking the neighborhood’s physical space. It’s less about the streets themselves, than it is about changing who’s downtown. On this front, CitySquare can’t, and won’t, go it alone. Worcester is a young city. It’s a college town. Boston and Cambridge are college towns, too, and they’ve become economic powerhouses by harnessing their college-educated youth, who eat and drink and work and start new companies in the urban core. Worcester’s colleges haven’t had the same sort of transformative effect, because they’re clustered around, not in, the urban core. That’s changing now. 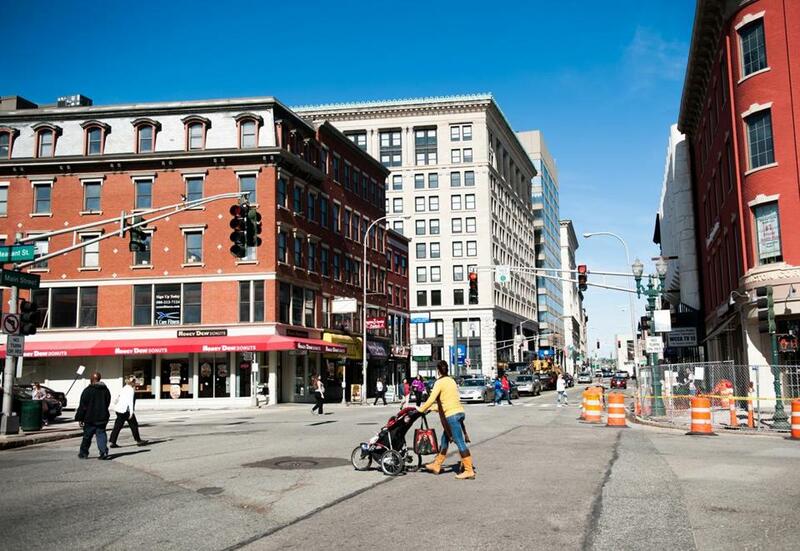 The emergence of Worcester’s collegiate downtown is as big as anything happening at CitySquare. An industrial park at the northern edge of Worcester’s downtown used to draw comparisons to Chernobyl. Now, where acres of highly contaminated factories once stood, Gateway Park has brought the Worcester Polytechnic Institute off its hillside campus, and into the downtown. Gateway Park mixes WPI classrooms with private office space and startup incubator space. Dormitories stand next to a private hotel. Across the street, a former high school is being converted to mixed-income loft apartments. WPI’s presence has turned a former urban industrial wasteland into a burgeoning mixed-use district. It’s the same type of spinoff development Cambridge has built around MIT for years; it works just as well off I-290 as it does at Broadway in Kendall Square. Development linked to urban colleges surrounds the CitySquare construction site. The Massachusetts College of Pharmacy and Health Sciences, which once had only a handful of Worcester students, has grown its presence downtown to over 1,000 students. The school has plans to double that figure in the coming years. Becker College, a leader in video game design, has begun housing some of its students downtown. Quinsigamond Community College is opening a major new downtown campus in the former home of the Worcester Telegram & Gazette. Taken together, these moves have poured thousands of new bodies into Worcester’s downtown, for up to 18 hours per day. They’ve enlivened city sidewalks and provided a boost to downtown retailers. This is the same game plan that Boston used, through Emerson College and Suffolk University, to reanimate the once-dead Downtown Crossing. Of course, reanimating the downtown, and getting new residents and shoppers to buy into the downtown, is the goal CitySquare is working toward. CitySquare has already delivered a new street grid and a pair of commercial buildings, including a new headquarters for the insurer Unum. The office workers are nice to have, but it’s the development project’s next phase that’s a game-changer for Worcester’s downtown. A financing proposal that would enable the construction of a 150-room hotel and a 350-unit apartment complex at CitySquare is currently pending before Worcester’s city council. Modern downtowns — neighborhoods that don’t go dark at 5 p.m. — need hotel visitors and permanent residents. CitySquare is closing in on them because the project doesn’t have to be a pioneer. There’s already momentum to draft behind.